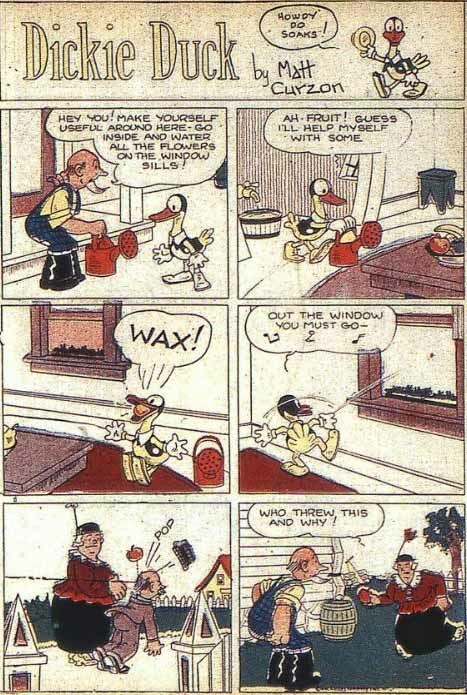 Dickie Duck was featured in a short gag strip which appeared in New Comics #1 (the first issue in the series that would become DC Comics' long-running Adventure Comics series). Dickie Duck was not the most sensitive talking duck. Much of what he said was offensive to fat people. Oddly enough, Dickie Duck interacted with humans, not other animals. Dickie Duck was a talking duck who casually interacted with humans, which is somewhat different from standard anthropomorphic animal fare.